I needed something quick to take to a friends’ dinner party, but couldn’t decide between my usual list of go-to favorites. Everything just seemed boring, or over-used. Imagine you’re trying to get ready for a night out and staring down the gauntlet that is your own closet. Nothing grabs you, nothing fits the venue just right, etc. 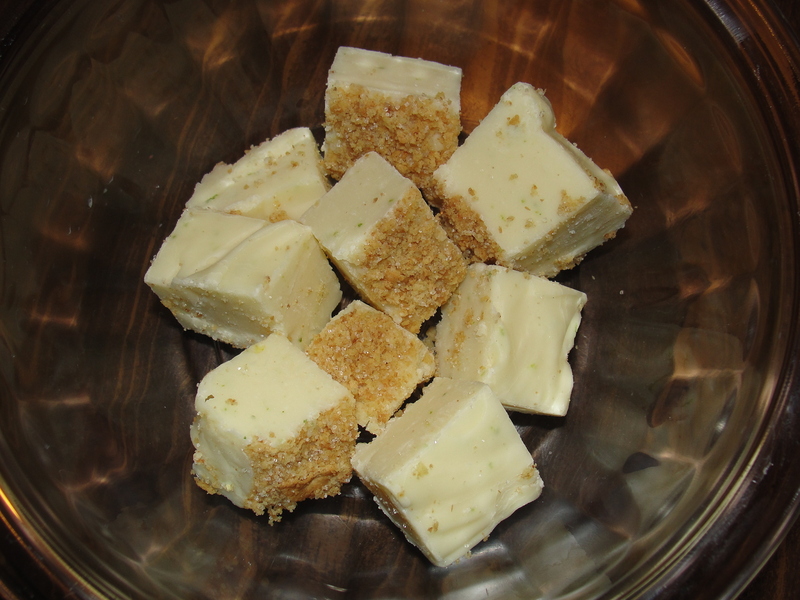 Giving up on finding inspiration within my own pantry, I decided to troll through my browsers bookmarks, and settled on tweaking some Key Lime Pie Fudge bites that I had found on About.com. The prep was simple, the amount of effort involved was minimal, yet when finished I was left with creamy little bites of heaven. These are THAT good! This is not your Grandma’s fudge. Give them a try. You will never think of fudge the same way again. Either in a microwave, or on the stove-top, melt butter. When melted combine butter, sugar, and graham crackers in a bowl, stirring until evenly combined and moist. Transfer graham cracker mix into your foil lined pan, smoothing and spreading to make an even layer. Bake the crust for 7-10 minutes, until the edges are lightly browned. Remove from oven and let cool. Melt chocolate, salt, and condensed milk in a stove-pot over medium low heart, stirring until evenly combined. When mixture is smooth, add lime juice and zest, stirring until evenly combined. Transfer the fudge to the prepared baking dish, spreading into an even layer over the graham cracker crust. Refrigerate fudge until it is set, about 2 hours, or overnight. Using the foil as handles, remove the fudge from the baking dish. Using a sharp, hot knife (run under hot water periodically to keep hot) cut the fudge into 1 inch squares. Let the fudge rest at room temperature for 15-2o minutes before serving.